YANGON — Here’s some good news for Yangon’s foodies: Now you can get a tasty beefsteak at very reasonable prices — and you can experience this fine dining menu in a laid-back, streetside environment. 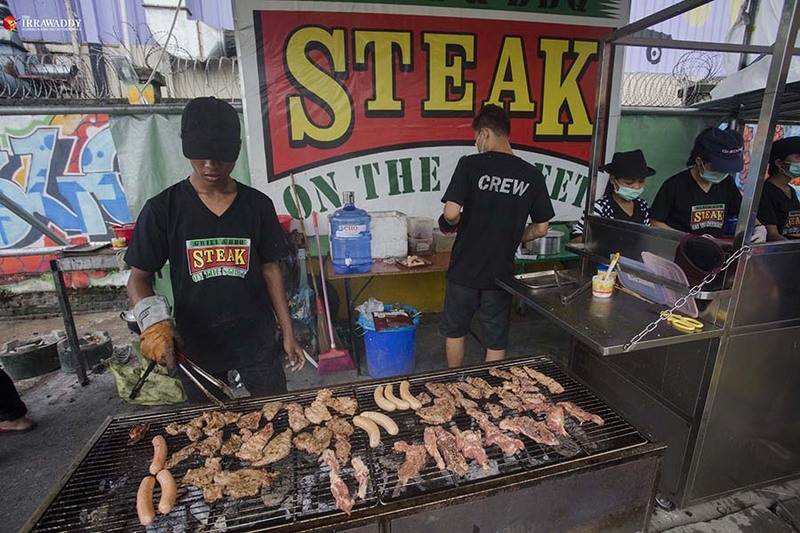 Steak on the Street opened as a weekend street-food stall near Yangon International School in February. Eight weeks later, it has become a “bomb” among meat lovers, known for its beefsteak and pork neck. “Actually, we all have [other] professional jobs; the idea grew out of our private gatherings and family house parties, because one of our friends is really good at cooking beefsteak. He would always bring beef to the gatherings,” said Ko Bo Gyi, one of the founders of Steak on the Street. One day, this group of friends — five in all — discussed ways of setting up their own business that wouldn’t get in the way of their existing full-time jobs. That was when the weekend beefsteak stall popped up. “We choose to open on the weekends because we all have full-time jobs during the week. And, as a fun business, initially we didn’t take this very seriously at all,” he said. “After eight weeks, however, things got more serious.” That’s because the stand quickly developed a reputation on social media. In the beginning, the partners split up all the duties and did all the work themselves. Later, they decided they needed to hire staff. “Eight weeks means 16 days for our shop, and [as it became more popular] we had to adjust our timetables, such as for marinating our meat, and we needed to buy more meat,” Ko Bo Gyi said. Then, the owners decided to expand their hours, and move to a larger location beside South Okkala’s City Mart. The new location, which opened in May, is open from 3pm to 10pm. 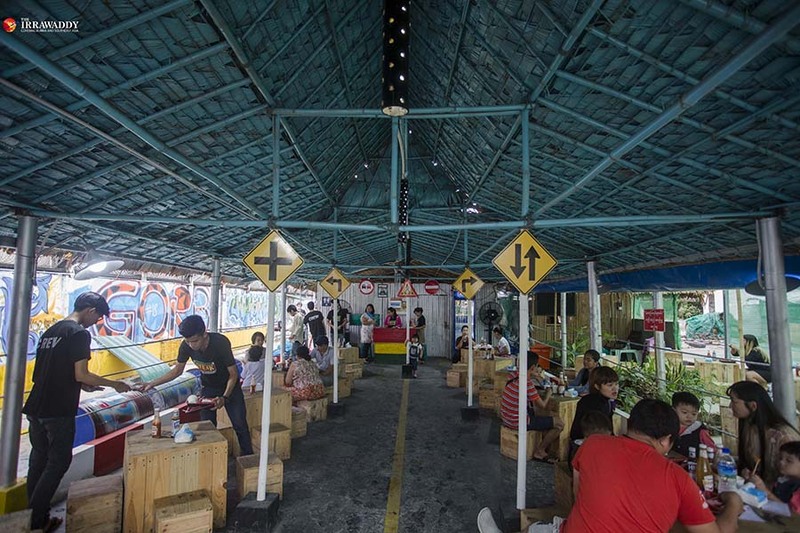 The business concept is a good quality steak served in a simple location at street-food prices. 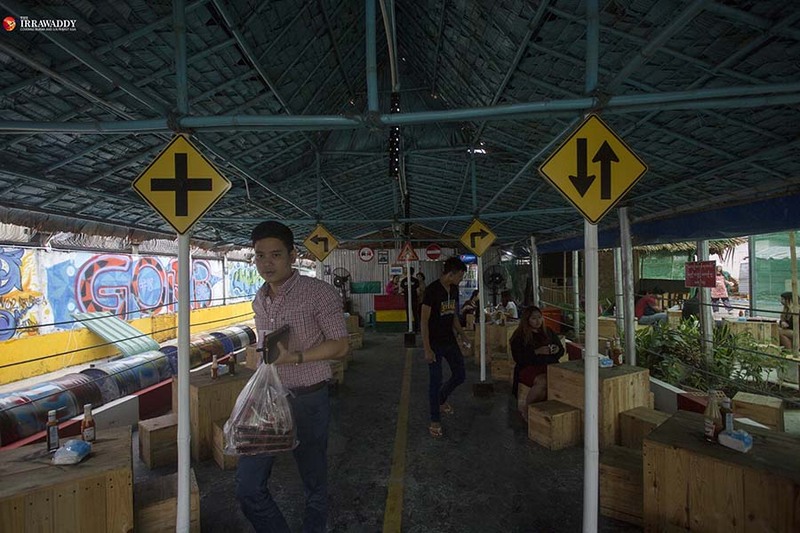 They have tried to maintain this concept after upgrading their stall to a proper shop, Ko Bo Gyi said. “As you see, the shop is not too big and does not have air-conditioning; it’s open-air. We decorated the shop with a lot of street signs, graffiti and so on,” he said. Even though the shop is not really a stall set up on the sidewalk, it is close to the street and simply decorated. The feeling is relaxed and the seating consists of wooden low tables and chairs. The shop can serve about 50 people in total, and fills many take-away orders. The shop’s famous beef tenderloin steak is excellent; the beef is local but very tender. The sauce spread on the meat wasn’t great, but not bad. Best of all, it only cost 6,000 kyats. Another famous dish, pork collar, costs 4,500 kyats. This one is fine, if not as special as the steak. It’s still worth it for its cheap price and good taste. We also tried their chicken sausage (4,000 kyats), which mixes spicy and normal flavors in one dish. I thought this was so-so; maybe I’m just not a chicken lover. 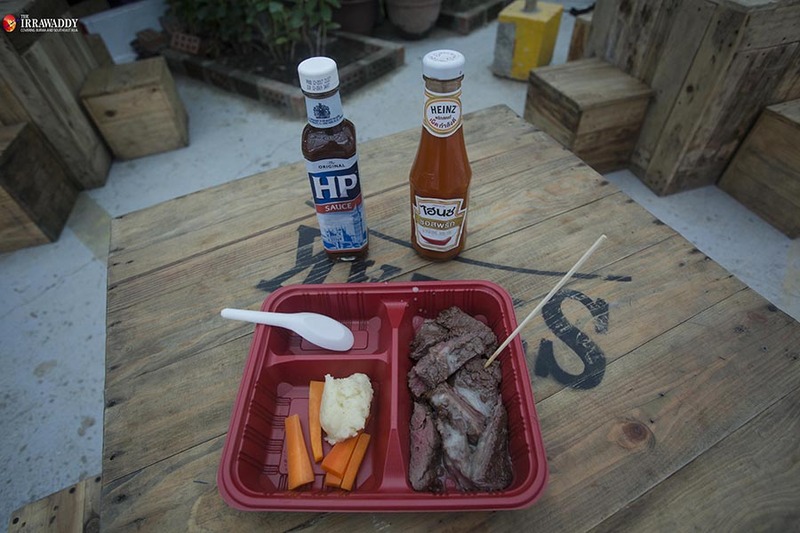 All the grilled items are served up with mashed potato and carrots. The shop also has other choices on the menu, such as grilled prawn and papaya salad. I went there with a friend and the total bill was only 14,500 kyats, and we left with a full stomach. The staff are part-time workers and most of them are students, but they were helpful and polite. The shop also pays attention to hygiene, with all of the grill operators and prep staff using masks, hats and gloves. The food was served in single-use plastic boxes. It’s easy to find the shop; it’s beside South Okkala’s City Mart as I mentioned before. They also accept phone orders and you can check this on their Facebook page, “STEAK on the Street”.